Do you ever find yourself with a block of time with your kids that you’ve just GOT to fill somehow? Maybe you need to prep dinner, or you’ve used up all your screen time for the day, or they’re just driving you nuts and need a little more structure. Whatever, the scenario, you need an activity to fill some time, and you’re willing to try ANYTHING. 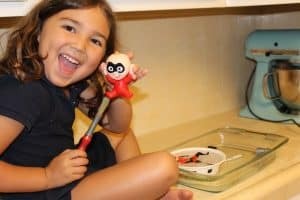 And so it was that this Incredibles 2 themed easy STEM preschool activity was born. Around 2 p.m., it became abundantly clear that A.) my two year old was not going to take a nap, so B.) he would go to bed early, and thus C.) our family walk that takes up the last hour of the day was clearly NOT going to happen. So what in the world would I do with Lila? We’ve been obsessed with ice lately (read about the time we painted it here!) and so I decided that I would trap some of her favorite toys inside a block of ice. Originally, I had planned to freeze Belle. 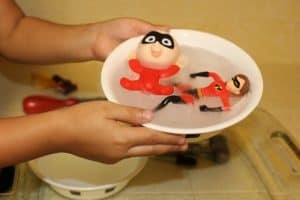 But ice makes me think of Frozone, so I grabbed the Incredibles toys instead. 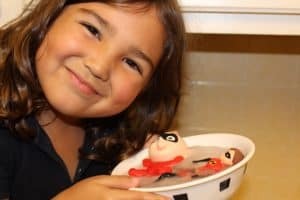 This fun, engaging little Incredibles themed educational activity was born. This post contains affiliate links. You can read more at our legal page. Thank you for supporting The Salty Mamas! 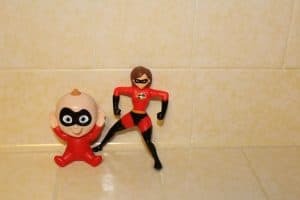 Incredibles 2 was recently released on DVD, so we’ve got Incredibles on the brain. If you haven’t seen yourself, do yourself a favor and grab the DVD here. It’s a super cute movie, and the whole family (from age 2 to 32!) loved it. Also, if you’re anything like me, you hit up McDonalds sometimes. And by sometimes, I mean a lot. 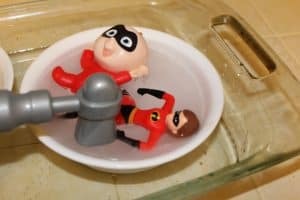 You may even have the exact same collection of Incredibles 2 toys, collected diligently over the summer and now taking up space in a toy bin near you. If not, you can get a set of 3 inch figurines on Amazon. Trapping the toys in ice could not be any simpler. 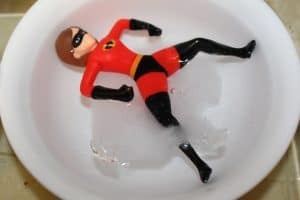 Simply fill a bowl with water, drop in the figurines, and stick it in the freezer for an hour or two. Like I said, ours went in at 2 pm, and were ready to come out at 6:30. Your freezer may vary, so I’d go stick them in there right now if I were you. You can decide how dramatic you want to play this. Would your child enjoy some mystery? Would they rather just get to work? How much backstory you give them is up to you. If your child is like Lila, they might need some coaxing to get engaged in a new activity. So when it was time to present our S.T.E.M. activity, I pulled out all the stops. I brought the toys out of the freezer, and then, in a panicked voice, called for Lila. 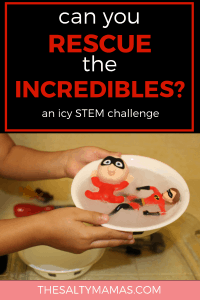 I explained to her that Frozone had accidentally encapsulated Elastigirl and Baby JackJack in ice, and that he need our help to save them…before it was too late. ( Dun-dun-DUN optional). And she was in, hook, line, and sinker. We also made an adorable, ready to print Frozone Rescue Letter. It’s a subscriber exclusive, so make sure to sign up for our newsletter here if you want a copy! (You’ll get the password to our Printables Library after signing up). You know I’m a big fan of process-based activities, and this kids’ science project is no exception. I set out a variety of tools for Lila to use, showed her the options, and then left her to her own devices. I recommend giving them something to hit with (like a plastic hammer), something to rub with (like a paintbrush), and then a few water-dropping toys (we used syringes and eye droppers). You can even say that Frozone has left these tools for you to work with, if that’s your shtick. Let the kids spend some time experimenting with the various tools. If they ask for others, feel free to provide them (within reason, obviously). I also recommend placing a baking dish under your bowl. This activity could end up pretty sloshy and fun, so you want something in place to catch that water as it melts. If you’re lucky, your child will stumble upon the idea of using warm water on their own. Or they may say that they need to make it warmer. Either way, you want to guide them in the direction of adding some warm water to their materials. I knew that I wanted Lila to end up using warm water, so I put out a couple of tools that would point her in that direction. She needed help learning how to use the eyedropper and the syringe. I let her experiment for a bit, and then showed her how to best use them. I mean, if your kid has this in the bag, more power to them. But the true benefit of S.T.E.M. activities for kids comes from them making discoveries for themselves. You can ask more leading questions, or do a think aloud, (“hmm, I remember when we made popsicles, I had to run them under warm water to get them out of the popsicle mold. I wonder if something like that would work again?”). It can be hard to see your kids struggle, but half the fun comes from having figured it out all by themselves. Don’t rob them of the opportunity! Eventually, Lila realized that she was spending a whole lot of time transferring hot water to the ice. She finally picked up the block of ice and dunked the whole thing into the warm water. It went SO much faster at that point, and to be honest, I was a bit disappointed. But you know what? She learned a lesson in efficiency, and she figured something out for herself, and for that, I was very, very proud. There is plenty of opportunity here to talk about scientific concepts. From state changes to heat transfer, there are big opportunities here for kids to learn a lot of neat stuff. That is- if they want to. Lila was really interested in the fact that the temperature caused the water to change states from a solid to a liquid. She seemed intrigued by the fact that the hot water was giving its energy to the ice and melting it. She could not possibly have cared less about the fact that the increased surface contact that resulted from dunking the block of ice in the warm water caused it to melt much faster. I mean, did I try to bring it up? I mean, women in S.T.E.M. So yeah. But she wasn’t into it, so I let it go. I let her focus on how “cool” it was that it was melting, and oohed and ahhed over her “magic trick.” Because FIVE. Don’t be surprised if your kid wants to repeat this activity again. And again. And again. In fact, you might want to have some more blocks of ice prepared, just in case. You can change up the activity by offering different tools, asking them to do it without water this time, or even by simply changing the color of the water. Keep it fresh, keep it fun, and most importantly- let them keep on experimenting. Looking for more fun ways to help your kids learn at home? Give these posts a read! Tried this activity? Tell us how it went in the comments below!